If you have previously said you would be a volunteer boater for the Monday, May 15 MLSC Lake St. Clair bass fishing outing I sent you an email with the details yesterday evening. Please look for it. We have 35 anglers from the state legislature, the NRC, the MDNR, MUCC and press. We may have a few more from those sources yet including possibly someone from the City of Saint Clair Shores. The inserted images below contain all the details on the event and following luncheon that I have sent to the angler participants. Please respond to the email I sent you, or post on here and confirm you are still coming! We have to provide a head count for the luncheon on Monday (and I want to make sure we have enough boats!). We are launching at the 9 Mile Road boat ramp. I am trying to get the City of Saint Clair Shores to wave the $15 launch fee for our event. I think they will but it is possible they donâ€™t. Regardless, we think this is the best available location for this event considering all variables. Because we can only launch a couple boats at a time we will be matching up the anglers with boaters and sending you to the launch as we can with no morning meeting. Weâ€™ll try to have someone available to carpool back and forth from the launch to the parking lot to save time. Weâ€™ll be launching from 8am until ~9am depending upon how timely everyone is, accommodating anyone stuck in traffic or lost and how long it takes to get everyone going. Once you launch and have your angler with all his/her stuff, you are welcome to go fishing. We need everyone back at the 9 Mile Road boat ramp by 12 noon! It will take some time to get everyone back on the trailers, and we want to get you heading towards the luncheon a little over 2 miles north at the VFW Hall #1146 (a few blocks north of 11 Mile Road â€“ see the maps below). We hope to have everyone eating by 1pm. Lunch is being paid for by The Bass Federation of Michigan, Michigan B.A.S.S. Nation and the MLSC Advisory Council. This is a much larger expenditure than the previous 2 MLSC bass fishing outings due to being a sit-down luncheon and about 3 times as many participants. Also, our way of saying thanks to you too! 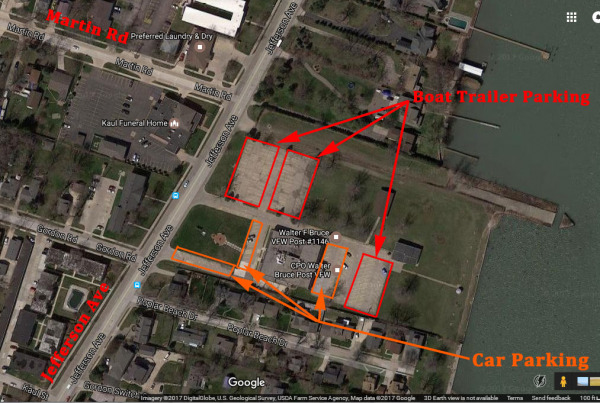 Note in the images below the parking areas we want the boaters to use â€“ most importantly at the VFW Hall. To get all the boaters to fit in there weâ€™ll need to get you parked close and orderly. At the VFW Hall weâ€™ll want you to pull into the north parking lot on the left near Jefferson Avenue and back into the farthest available parking spot from the entry drive on the east end of the lot first leaving open the middle so everyone can pull out through the middle when they want to leave. Weâ€™ll need you to park perpendicular and close to the previous boat trailer to fit as many as possible. After the east side is full, weâ€™ll start the same process on the west side farthest from the entry drive. Weâ€™ll park some more trailers at an angle in the back east end of the parking lot behind the hall (nearest to the lake). We are looking at some overflow options in case we end up without enough room at the hall. Things to bring: Please bring any extra life jackets you have. Most of the anglers donâ€™t have or bring one. If you have any extra rain gear, that could be real helpful too even for wave splash. Weâ€™ve asked them to bring some but itâ€™s likely they donâ€™t have any or anything suitable for the big water. As mentioned before, please have available some spinning rods/reels and some tackle the anglers can use. Many will not have any or at least likely do not have what works best on our big lake. Some water too maybe though I have told the anglers to bring any beverages they want for the morning. Please follow our good general safety practices â€“ kill switch attached and life jackets on when running the big motor. Remember that some of these anglers have little or no big water experience. What you are used to may make them very anxious or even fearful. There will be a large range of fishing experience and know-how too. This may be a rare or even first fishing experience for some participants so your patience and help may be greatly appreciated! The idea is to be very safe, and have fun! I know you will all be great ambassadors for our sport and our lake! Though this will be a catch-and-release only event PLEASE take some pictures while fishing even if you donâ€™t catch any/many! Please text them my cell phone I provided in the email, or email them to me (djkimmel 'at' greatlakesbass dot com). We will most likely have some or many of them featured on Bassmaster.com, and in BASS TIMES and the FLW Bass Fishing magazines! If you really feel up to it take a short video(s) as video is in high demand! It is slightly possible if ALL the boaters I have on the list now make it that we end up with a few too many boaters. I would much rather have too many boaters than not enough! We havenâ€™t had that â€˜problemâ€™ in the past though weâ€™ve had less than half this many participants too. Please bear with us. If this happens you are still welcome to fish and have lunch with us. There is always the possibility if we have every participant show up and a few late add-ons (more likely from past experience) that we may ask a few of you to take out 2 anglers if you are willing and able. 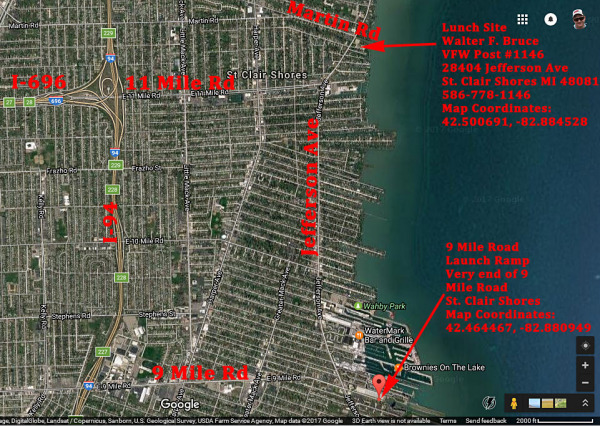 Large overview map showing both the launch ramp and luncheon locations in relation to each other. From west/Lansing area, get on I-696 East to I-94 West (south). Take Exit 227 - 9 Mile Road. Turn right (East) on 9 Mile Road and follow it all the way to the end past Jefferson Avenue to the 9 Mile Road boat ramp. From north or south, get to I-94 to Exit 227 following the same directions from there. Click on the map image where you can go to an expandable version of the image to see it better. We are launching between 8am and 9am. The sooner you can get there the sooner we can get everyone fishing. 9 Mile Road boat ramp close-up of the area, and how we will be trying to park the anglers' passenger vehicles verses the boat trailers. If you are not familiar with the ramp location, MAKE SURE you mark the canal entrance! There are dozens of canals in the area so it can be confusing when returning as to which canal to enter to get back to the launch ramp. We hope to have everyone eating by around 1pm. So please be back at the ramp by noon. It will take some time to get everyone back on their trailers, and get all the boaters parked at the VFW Hall. 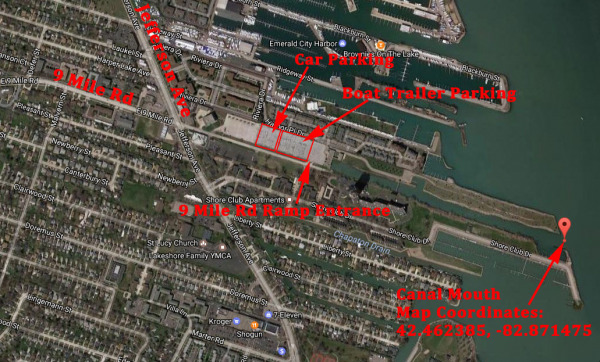 See the map for where we hope to park vehicles with trailers. We'll need to have you park close together, side-by-side perpendicular to Jefferson Ave first at the east end of the front parking lot, and then the west end of the front parking lot. We'll also park some boat trailers at an angle at the very back of the back parking lot too. We may have alternative parking options in case we can't fit everyone at the hall. If someone who isn't able to be a boater is so kind as to come down to either the boat launch in the morning, or the VFW Hall after noon, we could use some help from a few person in getting everyone parked especially at the VFW Hall, and ferrying anglers/boaters from the ramp parking lot to the actual launch ramps since it is a long walk between them! Contact me if you are able to help out! Thank you! The guy I winter store my boat with finally said I can get my boat out Monday...I should be able to get it back together by the following Monday..Hopefully I can lake test it by then also.. I need to find a different setup for the winter..
Hopefully someone has been out that can at least give me some depths to start at....Sounds like things are running a little behind..
Never launched at 9 mile.. I hope you get 'er done! We'll try to get some information available for anglers who need it. I haven't been there yet either. Things are a little behind but it is slowly starting to happen regardless. The catching was happening shallow until recently. Haven't heard for sure yet if the bite has spread out and picked up a little, but that seems to be what I'm starting to hear. Most of the people we will be taking out probably have never backed in a trailer..If we could get as many volunteers to help back the rigs in and park them that would probably help a ton....It sounds like that launch can be a PIA and if the boater has to launch then park his rig and make his way back that is really going to tie things up..Same with , when it becomes time to load.. Most likely the anglers will not be good at backing in trailers and parking. I would love to have some volunteers to help with that but finding them and getting them down there is proving difficult so far. I have asked. Will do it if I can get a few warm bodies down there. At this time, it appears we have the launch fee situation taken care of so boaters will not have to pay the daily $15 launch fee. TBF of Michigan will be covering it. Say thanks to Dave Reault when you see him. Got the info Dan...Thanks....Very sorry for the loss..
Will let you all know about next year. Maybe a smaller event rescheduled this year for later this summer but unsure about that. I wanted to see if anyone on this board would be willing to work with me on putting together a tournament in honor of Rep Kivela. I'm thinking this could be a great opportunity to raise some money for suicide prevention or another charity that works to help people over come the addiction that plagued this great legislator. Rep. Kivela was a champion for the outdoors and was not afraid to cross the aisle in order to accomplish what was best for the State of Michigan. I'm hoping we can take this tragedy and use it as a way to help others facing the same challenges and struggles. An interesting idea..? Wonder if it would be possible yet to put something together this year? Wonder if those related to the situation would be open to this, okay?